ARLINGTON, VA, Nov. 14, 2011 – PBS KIDS today announced its first augmented reality app for iPhone and iPod touch, FETCH! Lunch Rush, which is now available on the App Store. Available for free, the app uses the camera on iPhone or iPod touch to overlay computer-generated graphics on top of the physical, real-world environment. Extending PBS’s leadership in using augmented reality as an educational tool, FETCH! Lunch Rush opens a new world of learning by teaching kids ages six to eight math skills, like addition and subtraction, while blending the virtual and real world into a truly engaging experience. The FETCH! 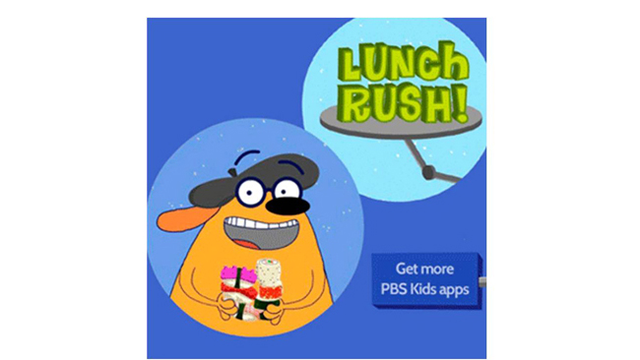 Lunch Rush App was produced by PBS member station WGBH and is based on the PBS KIDS GO! series FETCH! With Ruff Ruffman, also produced by WGBH. In this multiplayer app, Ruff Ruffman has to collect the lunch order for his studio crew. The challenge is keeping track of how many pieces of sushi everyone wants using augmented reality “markers” (printable hand-outs) that prompt activity within the app. The app uses 3-D imagery to reinforce the early algebraic concepts, helping kids to make the connection between real objects and corresponding numeric symbols. The FETCH! Lunch Rush App is available for free from the App Store on iPhone or iPod touch or at www.itunes.com/appstore. Developed in partnership with the Corporation for Public Broadcasting and powered by a Ready To Learn grant from the U.S. Department of Education, FETCH! Lunch Rush is part of a new suite of games available on the newly launched PBS KIDS Lab website (PBSKIDS.org/lab). Combined with online and interactive whiteboard games, this new app helps build a learning experience for kids that takes place across platforms, all with the goal of accelerating learning. In addition to FETCH!, six suites based on hit PBS KIDS series are available on the PBS KIDS Lab: THE CAT IN THE HAT KNOWS A LOT ABOUT THAT!, CURIOUS GEORGE, SID THE SCIENCE KID, FIZZY’S LUNCH LAB, SUPER WHY!. and DINOSAUR TRAIN. To date, PBS KIDS mobile apps have been downloaded more than 1.4 million times. With a transmedia approach, PBS KIDS is increasingly serving children wherever they live, learn, and play – through mobile devices, as well as on TV, online, in the classroom, and through a new line of educational toys. For images of the FETCH! Lunch Rush App, please visit PBS PressRoom. CPB, a private, nonprofit corporation created by Congress in 1967, is steward of the federal government’s investment in public broadcasting. It helps support the operation of more than 1,300 locally-owned and operated public television and radio stations nationwide, and is the largest single source of funding for research, technology, and program development for public radio, television and related online services. The Ready To Learn Initiative is a grant program managed by the U.S. Department of Education's Office of Innovation and Improvement. It supports the development of innovative educational television and digital media targeted at preschool and early elementary school children and their families. Its general goal is to promote early learning and school readiness, with a particular interest in reaching low-income children. In addition to creating television and other media products, the program supports activities intended to promote national distribution of the programming, effective educational uses of the programming, community-based outreach, and research on educational effectiveness. WGBH Boston is America's preeminent public broadcasting producer and the single largest source of prime-time and children's programming for PBS and pbs.org. Among the WGBH-produced children's titles: Arthur, Curious George, Postcards from Buster, Between the Lions, Design Squad, Martha Speaks, FETCH! with Ruff Ruffman, and Peep and the Big Wide World. For more information, visit www.wgbh.org. Photo credit: (C) 2011 WGBH Educational Foundation. All rights reserved.